New funding has been secured to support dozens more people in Staffordshire and Stoke-on-Trent who experience serious mental illness to find and retain work. The Together We’re Better partnership of NHS and local government organisations that is working to transform health and care services in the area has been successful in bidding for more than £200,000 from NHS England to expand individual placement and support (IPS) services. New and expectant mothers and those trying to conceive will benefit from a major investment in mental health services. Around 20 per cent of women experience mental health difficulties while they are planning a pregnancy, are pregnant or during the first year following the birth of their baby. This covers a wide range of conditions and if left untreated can have significant and long-lasting effects on the woman and her family. Now £833,000 is to be invested in improving perinatal mental health services across Staffordshire, Stoke-on-Trent and Shropshire that will directly help around 850 mothers by 2021. As the Together We’re Better partnership prepares to enter a new chapter in its journey of local health and care transformation, the clinician’s and health and social care professional’s voice, as well as the patient’s and service user voice, is more important than ever. While it’s crucial their views are expressed during the next phase of public engagement taking place in July, it’s equally important that clinicians and health and social care professionals continue to play a leading role in determining how that transformation is being delivered. Within Together We’re Better, Dr John James and Roger Wade are working hard to identify and empower clinical and health and social care leaders leaders in their role as Medical Director for Primary Care and Secondary Care respectively. 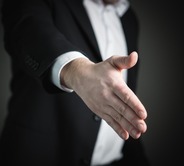 Together We're Better Director Simon Whitehouse has welcomed the merger on June 1 of South Staffordshire and Shropshire NHS Foundation Trust and Staffordshire and Stoke-on-Trent Partnership NHS Trust to form the new organisation - Midlands Partnership NHS Foundation Trust. 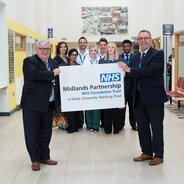 "Congratulations and welcome to the newly formed Midlands Partnership NHS Foundation Trust," said Simon. "I very much look forward to working with colleagues at the trust on delivering the transformation of health and care that local people in Staffordshire and Stoke-on-Trent deserve." The NHS is celebrating its 70th birthday on 5th July and Together We’re Better is encouraging the public and staff to hold a tea party and, over a cuppa, share their experiences of what is good about the NHS and what needs to change. These celebrations, dubbed ‘Staffordshire Tea Party’ and ‘Stoke-on-Trent Tea Party’, will provide an excellent opportunity for local people to help shape the NHS for the next 70 years. Together We're Better Pan Staffordshire Maternity Voices Partnership is holding Perinatal Mental Health Stakeholder Events on Monday 18th June in Stafford and Thursday 28th June in Stoke-on-Trent, which aim to gather feedback from women and their families about their experiences of using mental health services in Staffordshire or Stoke-on-Trent during pregnancy and/or up to your baby’s first birthday. This information will then be used to shape services in the future. Leaders and clinicians from organisations representing Together We’re Better met to focus on the work that has taken place over the previous 12 months as well as using the opportunity to share their emerging thinking on future plans. Together We're Better Chairman Sir Neil McKay has visited Leek and Cheadle community hospitals in the Moorlands, Haywood and Longton hospitals in Stoke-on-Trent, and Bradwell Hospital in Newcastle-under-Lyme. As well as receiving a tour, Sir Neil has also been meeting with campaigners at each hospital to listen to their views.